Maltese (Maltese: Malti) is the national language of Malta and a co-official language of the country alongside English, while also serving as an official language of the European Union, the only Semitic language so distinguished. Maltese is descended from Siculo-Arabic, the extinct variety of Arabic that developed in Sicily and was later introduced to Malta, between the end of the ninth century and the end of the twelfth century. Maltese has evolved independently of Classical Arabic and its varieties into a standardized language over the past 800 years in a gradual process of Latinisation. Maltese is therefore considered an exceptional descendant of Arabic that has no diglossic relationship with Classical or Modern Standard Arabic, and is classified separately from the Arabic macrolanguage. Maltese is also unique among Semitic languages since its morphology has been deeply influenced by Romance languages, namely Italian and Sicilian. The original Semitic base, Siculo-Arabic, comprises around one-third of the Maltese vocabulary, especially words that denote basic ideas and the function words, but about half of the vocabulary is derived from standard Italian and Sicilian; and English words make up between 6% and 20% of the vocabulary. A recent study shows that, in terms of basic everyday language, speakers of Maltese are able to understand less than a third of what is said to them in Tunisian Arabic, which is related to Siculo-Arabic, whereas speakers of Tunisian are able to understand about 40% of what is said to them in Maltese. This reported level of asymmetric intelligibility is considerably lower than the mutual intelligibility found between Arabic dialects. Maltese has always been written in the Latin script, the earliest surviving example dating from the late Middle Ages. It continues to be the only standardized Semitic language written exclusively in the Latin script. The origins of the Maltese language are attributed to the arrival, early in the eleventh century, of settlers from neighbouring Sicily, where Siculo-Arabic was spoken, following the Fatimid Caliphate's conquest of the island at the end of the ninth century. This claim has been corroborated by genetic studies, which show that contemporary Maltese people share common ancestry with Sicilians and Calabrians, with little genetic input from North Africa and the Levant. The Norman conquest in 1090, followed by the expulsion of the Muslims (complete by 1249) permanently isolated the vernacular from its Arabic source, creating the conditions for its evolution into a distinct language. In contrast to Sicily (where Siculo-Arabic became extinct, replaced by Sicilian), the vernacular in Malta continued to develop alongside Italian, eventually replacing it as official language in 1934 (alongside English). The first written reference to the Maltese language is in a will of 1436, where it is called lingua maltensi. The oldest known document in Maltese is Il-Kantilena (Xidew il-Qada) by Pietru Caxaro. It dates from the 15th century. The earliest known Maltese dictionary was a sixteenth-century manuscript entitled "Maltese-Italiano"; it was included in the Biblioteca Maltese of Mifsud in 1764, but is now lost. A list of Maltese words was included in both the Thesaurus Polyglottus (1603) and Propugnaculum Europae (1606) of Hieronymus Megiser, who had visited Malta in 1588–89; Domenico Magri gave the etymologies of some Maltese words in his Hierolexicon, sive sacrum dictionarium (1677). An early manuscript dictionary, Dizionario Italiano e Maltese, was discovered in the Biblioteca Vallicelliana in Rome in the 1980s, together with a grammar, the Regole per la Lingua Maltese, attributed to a French Knight named Thezan. The first systematic lexicon is that of Giovanni Pietro Francesco Agius de Soldanis, who also wrote the first systematic grammar of the language and proposed a standard orthography. SIL Ethnologue (2015) reports a total of 522,000 Maltese speakers, with 371,000 residing in Malta (close to 90% of Maltese population) according to the European Commission (2012). This implies a number of some 150,000 speakers in the Maltese diaspora. Most speakers are bilingual, the majority of speakers (345,000) regularly use English, and a reported 66,800 regularly use French. The largest diaspora community of Maltese speakers is in Australia, with 36,000 speakers reported in 2006 (down from 45,000 in 1996, and expected to decline further). The Maltese linguistic community in Tunisia originates in the 18th century. Numbering at several thousand in the 19th century, it was reported at only 100 to 200 people as of 2017. Maltese is descended from Siculo-Arabic, a Semitic language within the Afroasiatic family, that in the course of its history has been influenced by Sicilian and Italian, to a lesser extent French, and more recently English. Today, the core vocabulary (including both the most commonly used vocabulary and function words) is Semitic, with large numbers of loanwords. Because of the Sicilian influence on Siculo-Arabic, Maltese has many language contact features and is most commonly described as a language with a large number of loanwords. The Maltese language has historically been classified in various ways, with some claiming that the ancient Punic language (another Semitic language) was its origin instead of Siculo-Arabic, while others believed the language to be one of the Berber languages (another family within Afroasiatic), and under the Fascist Kingdom of Italy, it was classified as regional Italian. SIL reports six varieties, besides Standard Maltese: Gozo, Port Maltese, Rural Central Maltese, Rural East Maltese, Rural West Maltese, and Zurrieq. Urban varieties of Maltese are closer to Standard Maltese than rural varieties, which have some characteristics that distinguish them from Standard Maltese. They tend to show some archaic features such as the realization of kh and gh and the imāla of Arabic ā into ē (or ī especially in Gozo)-considered archaic because they are reminiscent of 15th century transcriptions of this sound. Another archaic feature is the realization of Standard Maltese ā as ō in rural dialects. There is also a tendency to diphthongize simple vowels, e.g., ū becomes eo or eu. Rural dialects also tend to employ more Semitic roots and broken plurals than Standard Maltese. In general, rural Maltese is less distant from its Siculo-Arabic ancestor than Standard Maltese. Voiceless stops are only lightly aspirated and voiced stops are fully voiced. Voicing is carried over from the last segment in obstruent clusters; thus, two- and three-obstruent clusters are either voiceless or voiced throughout, e.g. /niktbu/ is realised [ˈniɡdbu] "we write". Maltese has final-obstruent devoicing of voiced obstruents and voiceless stops have no audible release, making voiceless–voiced pairs phonetically indistinguishable. Gemination is distinctive word-medially and word-finally in Maltese. The distinction is most rigid intervocalically after a stressed vowel. Stressed, word-final closed syllables with short vowels end in a long consonant, and those with a long vowel in a single consonant; the only exception is where historic *ʕ and *ɣ meant the compensatory lengthening of the succeeding vowel. Some speakers have lost length distinction in clusters. The two nasals /m/ and /n/ assimilate for place of articulation in clusters. /t/ and /d/ are usually dental, whereas /t͡s d͡z s z n r l/ are all alveolar. /t͡s d͡z/ are found mostly in words of Italian origin, retaining length (if not word-initial). /d͡z/ and /ʒ/ are only found in loanwords, e.g. /ɡad͡zd͡zɛtta/ "newspaper" and /tɛlɛˈviʒin/ "television". The pharyngeal fricative /ħ/ is velar ([x]) or glottal ([h]) for some speakers. Maltese has five short vowels, /ɐ ɛ i ɔ ʊ/, written a e i o u; six long vowels, /ɐː ɛː iː ɪː ɔː ʊː/, written a e ie i o u; and seven diphthongs: /ɐɪ ɛɪ/ both written għi, /ɐʊ ɔʊ/ both written għu, and /ɛʊ ɪʊ ɔɪ/ written ew iw oj. When two syllables are equally heavy, the penultimate takes the stress, but otherwise the heavier syllable does, e.g. bajjad [ˈbɐj.jɐt] 'he painted' vs bajjad [bɐj.ˈjɐːt] 'a painter'. B b be ballun (ball) b bar, but at the end of a word it is devoiced to [p]. D d de dar (home) d day, but at the end of a word it is devoiced to [t]. Ġ ġ ġe ġelat (ice cream) d͡ʒ gem, but at the end of a word it is devoiced to [tʃ]. G g ge gallettina (biscuit) ɡ game, but at the end of a word it is devoiced to [k]. GĦ għ ajn għasfur (bird) ˤː, ħː has the effect of lengthening and pharyngealizing associated vowels (għi and għu are [aˤj] and [oˤw]). When found at the end of a word or immediately before 'h' it has the sound of a double 'ħ' (see below). H h akka hu (he) not pronounced unless it is at the end of a word, in which case it has the sound of 'ħ'. Ħ ħ ħe ħanut (shop) ħ no English equivalent; sounds similar to /h/ but is articulated with a lowered larynx. O o o ors (bear) ɔ like 'aw' in law, but shorter. Q q qe qattus (cat) ʔ glottal stop, found in the Cockney English pronunciation of "bottle" or the phrase "uh-oh" /ʔʌʔoʊ/. V v ve vjola (violet) v vast, but at the end of a word it is devoiced to [f]. X x exxe xadina (monkey) ʃ / ʒ shade, sometimes as measure; when doubled the sound is elongated, as in "Cash shin" vs. "Cash in". Ż ż że żraben (shoes) z maze, but at the end of a word it is devoiced to [s]. Final vowels with grave accents (à, è, ì, ò, ù) are also found in some Maltese words of Italian origin, such as libertà ("freedom"), sigurtà (old Italian: sicurtà, "security"), or soċjetà (Italian: società, "society"). The official rules governing the structure of the Maltese language are found in the official guidebook issued by the Akkademja tal-Malti, the Academy of the Maltese language, which is named Tagħrif fuq il-Kitba Maltija, that is, Knowledge on Writing in Maltese. The first edition of this book was printed in 1924 by the Maltese government's printing press. The rules were further expanded in the 1984 book, iż-Żieda mat-Tagħrif, which focused mainly on the increasing influence of Romance and English words. In 1992 the Academy issued the Aġġornament tat-Tagħrif fuq il-Kitba Maltija, which updated the previous works. All these works were included in a revised and expanded guidebook published in 1996. The National Council for the Maltese Language (KNM) is the main regulator of the Maltese language (see Maltese Language Act, below) and not the Akkademja tal-Malti. However, these orthography rules are still valid and official. Since Maltese evolved after the Italo-Normans ended Arab rule of the islands, a written form of the language was not developed for a long time after the Arabs' expulsion in the middle of the thirteenth century. Under the rule of the Knights Hospitaller, both French and Italian were used for official documents and correspondence. During the British colonial period, the use of English was encouraged through education, with Italian regarded as the next-most important language. In 1934, Maltese was recognised as an official language. In the late eighteenth century and throughout the nineteenth century, philologists and academics such as Mikiel Anton Vassalli made a concerted effort to standardize written Maltese. 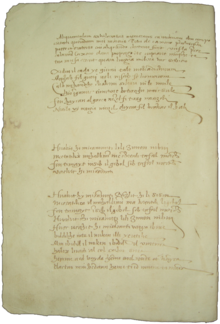 Many examples of written Maltese exist from before this period, always in the Latin alphabet, Il Cantilena being the earliest example of written Maltese. Although the original vocabulary of the language was Siculo-Arabic, it has incorporated a large number of borrowings from Romance sources of influence (Sicilian, Italian, and French), and more recently Germanic ones (from English). The historical source of modern Maltese vocabulary is 52% Italian/Sicilian, 32% Siculo-Arabic, and 6% English, with some of the remainder being French. Today, most function words are Semitic. In this way, it is similar to English, which is a Germanic language that had large influence from Norman French. As a result of this, Romance language-speakers may easily be able to comprehend more complex ideas expressed in Maltese, such as "Ġeografikament, l-Ewropa hi parti tas-superkontinent ta' l-Ewrasja" (Geographically, Europe is part of the Supercontinent of Eurasia), while not understanding a single word of a simple sentence such as "Ir-raġel qiegħed fid-dar" (The man is in the house), which would be easily understood by any Arabic speaker. An analysis of the etymology of the 41,000 words in Aquilina's Maltese-English Dictionary shows that words of Romance origin make up 52% of the Maltese vocabulary, although other sources claim from as low as 40%, to as high as 55%. These vocabularies tend to deal with more complicated concepts. They are mostly derived from Sicilian and thus exhibit Sicilian phonetic characteristics, such as /u/ in place of /o/, and /i/ in place of /e/ (e.g. tiatru not teatro and fidi not fede). Also, as with Old Sicilian, /ʃ/ (English 'sh') is written 'x' and this produces spellings such as: ambaxxata /ambaʃːaːta/ ('embassy'), xena /ʃeːna/ ('scene' cf. Italian ambasciata, scena). A tendency in modern Maltese is to adopt further influences from English and Italian. Complex Latinate English words adopted into Maltese are often given Italianate or Sicilianate forms, even if the resulting words do not appear in either of those languages. For instance, the words "evaluation", "industrial action", and "chemical armaments" become "evalwazzjoni", "azzjoni industrjali", and "armamenti kimiċi" in Maltese, while the Italian terms are valutazione, vertenza sindacale, and armi chimiche respectively. English words of Germanic origin are generally preserved relatively unchanged. Siculo-Arabic is the ancestor of the Maltese language, and supplies between 32% and 40% of the language's vocabulary. Żammit (2000) found that 40% of a sample of 1,820 Quranic Arabic roots were found in Maltese, a lower percentage than found in Moroccan (58%) and Lebanese Arabic (72%). An analysis of the etymology of the 41,000 words in Aquilina's Maltese-English Dictionary shows that 32% of the Maltese vocabulary is of Arabic origin, although another source claims 40%. Usually, words expressing basic concepts and ideas, such as raġel (man), mara (woman), tifel (boy), dar (house), xemx (sun), sajf (summer), are of Arabic origin. Moreover, belles lettres in Maltese tend to aim mainly at diction belonging to this group. The Maltese language has merged many of the original Arabic consonants, in particular the emphatic consonants, with others that are common in European languages. Thus, original Arabic /d/, /ð/, and /dˤ/ all merged into Maltese /d/. The vowels, however, separated from the three in Arabic (/a i u/) to five, as is more typical of other European languages (/a ɛ i o u/). Some unstressed short vowels have been elided. The common Arabic greeting as salāmu 'alaykum is cognate with is-sliem għalikom in Maltese (lit. the peace for you, peace be with you), as are similar greetings in other Semitic languages (e.g. shalom ʿalekhem in Hebrew). Note "fridge", which is a slang term derived from "refrigerator", a Latinate word which might be expected to be rendered as rifriġeratori (Italian uses a different word: frigorifero). Maltese grammar is fundamentally derived from Siculo-Arabic, although Romance and English noun pluralization patterns are also used on borrowed words. Adjectives follow nouns. There are no separately formed native adverbs, and word order is fairly flexible. Both nouns and adjectives of Semitic origin take the definite article (for example, It-tifel il-kbir, lit. "The boy the elder"="The elder boy"). This rule does not apply to adjectives of Romance origin. Nouns are pluralized and also have a dual marker. Semitic plurals are complex; if they are regular, they are marked by -iet/-ijiet, e.g., art, artijiet "lands (territorial possessions or property)" (cf. Arabic -at and Hebrew -ot/-oth) or -in (cf. Arabic -īn and Hebrew -im). If irregular, they fall in the pluralis fractus category, in which a word is pluralized by internal vowel changes: ktieb, kotba " book", "books"; raġel, irġiel "man", "men". Words of Romance origin are usually pluralized in two manners: addition of -i or -jiet. For example, lingwa, lingwi "languages", from Sicilian lingua, lingui. Words of English origin are pluralized by adding either an "-s" or "-jiet", for example, friġġ, friġis from the word fridge. Some words can be pluralized with either of the suffixes to denote the plural. A few words borrowed from English can amalgamate both suffixes, like brikksa from the English brick, which can adopt either collective form brikks or the plural form brikksiet. The proclitic il- is the definite article, equivalent to "the" in English and "al-" in Arabic. The Maltese article becomes l- before or after a vowel. Maltese il- is coincidentally identical in pronunciation to the one of the Italian masculine articles, il, which is also l’ before, but not after, a vowel. Consequently, many nouns borrowed from Standard Italian did not change their original article when used in Maltese. Romance vocabulary taken from Sicilian did change where the Sicilian articles u and a, before a consonant, are used. In spite of its Romance appearance, il- is related to the Arabic article al-. Verbs show a triliteral Semitic pattern, in which a verb is conjugated with prefixes, suffixes, and infixes (for example ktibna, Arabic katabna, Hebrew kathabhnu (Modern Hebrew: katavnu) "we wrote"). There are two tenses: present and perfect. The Maltese verb system incorporates Romance verbs and adds Maltese suffixes and prefixes to them (for example, iddeċidejna "we decided" ← (i)ddeċieda "decide", a Romance verb + -ejna, a Maltese first person plural perfect marker). With Malta being a multilingual country, the usage of Maltese in the mass media is shared with other European languages, namely English and Italian. The majority of television stations broadcast from Malta in English or Maltese, although broadcasts from Italy in Italian are also received on the islands. Similarly, there are more Maltese-language radio programs than English ones broadcast from Malta, but again, as with television, Italian broadcasts are also picked up. Maltese generally receives equal usage in newspaper periodicals to English. By early 2000s, the use of the Maltese language on the Internet is uncommon, and the number of websites written in Maltese are few. In a survey of Maltese cultural websites conducted in 2004 on behalf of the Maltese Government, 12 of 13 were in English only, while the remaining one was multilingual but did not include Maltese. The Maltese population, being fluent in both Maltese and English, displays code-switching (referred to as Maltenglish) in certain localities and between certain social groups. ^ Hammarström, Harald; Forkel, Robert; Haspelmath, Martin, eds. (2017). "Maltese". Glottolog 3.0. Jena, Germany: Max Planck Institute for the Science of Human History. ^ "Constitution of Malta". Retrieved 3 December 2017. ^ So who are the 'real' Maltese. Archived from the original on 2016-03-12. The kind of Arabic used in the Maltese language is most likely derived from the language spoken by those that repopulated the island from Sicily in the early second millennium; it is known as Siculo-Arab. The Maltese are mostly descendants of these people. ^ Brincat, 2005. Maltese - an unusual formula. Archived from the original on 2015-12-08. Originally Maltese was an Arabic dialect but it was immediately exposed to Latinisation because the Normans conquered the islands in 1090, while Christianisation, which was complete by 1250, cut off the dialect from contact with Classical Arabic. Consequently Maltese developed on its own, slowly but steadily absorbing new words from Sicilian and Italian according to the needs of the developing community. ^ Robert D Hoberman (2007). Morphologies of Asia and Africa , Alan S. Kaye (Ed. ), Chapter 13: Maltese Morphology. Eisenbrown. ISBN 9781575061092. Archived from the original on 2017-09-30. Maltese is the chief exception: Classical or Standard Arabic is irrelevant in the Maltese linguistic community and there is no diglossia. ^ "ISO 639 Code Tables". Archived from the original on 2017-12-16. ^ Robert D Hoberman (2007). Morphologies of Asia and Africa , Alan S. Kaye (Ed. ), Chapter 13: Maltese Morphology. Eisenbrown. ISBN 9781575061092. Archived from the original on 2017-09-30. yet it is in its morphology that Maltese also shows the most elaborate and deeply embedded influence from the Romance languages, Sicilian and Italian, with which it has long been in intimate contact….As a result Maltese is unique and different from Arabic and other Semitic languages. ^ Brincat, 2005. Maltese - an unusual formula. Archived from the original on 2015-12-08. An analysis of the etymology of the 41,000 words in Aquilina's Maltese-English Dictionary shows that 32.41% are of Arabic origin, 52.46% are from Sicilian and Italian, and 6.12% are from English. Although nowadays we know that all languages are mixed to varying degrees, this is quite an unusual formula. However, the words derived from Arabic are more frequent because they denote the basic ideas and include the function words. ^ a b c d e f g h i j k Brincat (2005). ^ a b c d e "BBC - Languages". Archived from the original on 13 September 2017. Retrieved 12 January 2017. ^ Borg, Albert J.; Azzopardi-Alexander, Marie (1997). Maltese. Routledge. ISBN 0-415-02243-6. ^ The Cantilena. Archived from the original on 2015-12-08. ^ Il-Kunsill Nazzjonali tal-Ilsien Malti. Archived from the original on 2014-01-06. Fundamentally, Maltese is a Semitic tongue, the same as Arabic, Aramaic, Hebrew, Phoenician, Carthaginian and Ethiopian. However, unlike other Semitic languages, Maltese is written in the Latin alphabet, but with the addition of special characters to accommodate certain Semitic sounds. Nowadays, however, there is much in the Maltese language today that is not Semitic, due to the immeasurable Romantic influence from our succession of (Southern) European rulers through the ages. ^ a b c "MED Magazine". 9 May 2008. Archived from the original on 9 May 2008. Retrieved 12 January 2017. ^ A.E. Felice; "The Genetic Origin of Contemporary Maltese," Archived 2014-01-11 at the Wayback Machine The Sunday Times of Malta,5 August 2007. ^ C. Capelli, N. Redhead, N. Novelletto, L. Terrenato, P. Malaspina, Z. Poulli, G. Lefranc, A. Megarbane, V. Delague, V. Romano, F. Cali, V.F. Pascali, M. Fellous, A.E. Felice, and D.B. Goldstein; "Population Structure in the Mediterranean Basin: A Y Chromosome Perspective," Archived 2013-08-28 at the Wayback Machine Annals of Human Genetics, 69, 1-20, 2005. Last visited August 8, 2007. ^ a b c d L-Akkademja tal-Malti. "The Maltese Language Academy". Archived from the original on 2015-09-23. ^ Arnold Cassola (2012). Italo-Maltese Relations (ca. 1150 -1936): People, Culture, Literature, Language Archived February 22, 2014, at the Wayback Machine. Mediterranean Review 5 (1): 1–20. ^ "As at the 2006 Australian Census, the number of Australians speaking Maltese at home was 36,514, compared to 41,250 in 2001 and 45,243 in 1996. The 2006 figures represent a drop of 19.29% when compared with the 1996 figures. Given that many of those who speak Maltese at home are over the age of 60, the number of Maltese speakers will invariably go for a nosedive by 2016." Joseph Carmel Chetcuti, Why It’s time to bury the Maltese language in Australia, Malta Independent, 2 March 2010. ^ Nigel Mifsud, Malta's Ambassador meets Maltese who have lived their whole life in Tunisia, TVM, 13 November 2017. ^ C.F. & F.M. Voegelin. 1977. Classification and Index of the World's Languages. Elsevier. Merritt Ruhlen. 1991. A Guide to the World's Languages, Volume 1: Classification. Stanford. David Dalby. 2000. The Linguasphere Register of the World's Languages and Speech Communities. Linguasphere Observatory. Gordon, Raymond G., Jr., ed. 2005. Ethnologue: Languages of the World. 15th ed. Summer Institute of Linguistics. Alan S. Kaye & Judith Rosenhouse. 1997. "Arabic Dialects and Maltese", The Semitic Languages. Ed. Robert Hetzron. Routledge. Pages 263–311. ^ Vella (2004), p. 263. ^ "Punic language". Encyclopædia Britannica Online. Encyclopædia Britannica Inc. 2013. Archived from the original on 15 June 2013. Retrieved 25 June 2013. ^ Sheehan, Sean (12 January 2017). Malta. Marshall Cavendish. ISBN 9780761409939. Retrieved 12 January 2017 – via Google Books. ^ Hume (1996), p. 165. ^ Borg (1997), p. 248. ^ Borg (1997), pp. 249–250. ^ Borg (1997), pp. 251–252. ^ Borg (1997), p. 255. ^ Borg (1997), p. 254. ^ Borg (1997), p. 247. ^ Borg (1997), p. 260. ^ Auroux, Sylvain (2000). History of the language sciences : an international handbook on the evolution of the study of language from the beginnings to the present. Berlin: New York : Walter de Gruyter. ISBN 978-3-11-011103-3. ^ Mifsud, Manwel (1995). Loan Verbs in Maltese: A Descriptive and Comparative Study. Brill Publishers. p. 31. ISBN 978-90-04-10091-6. ^ Friggieri (1994), p. 59. ^ Żammit (2000), pp. 241–245. ^ Compare with approx. 25–33% of Old English or Germanic words in Modern English. ^ Alan S. Kaye & Judith Rosenhouse. 1997. "Arabic Dialects and Maltese", The Semitic Languages. Routledge. Pp. 263–311. ^ "Country report for MINERVA Plus in 2005". Multilingual issues in Malta. Archived from the original on 2008-02-27. Retrieved 2008-02-24. Aquilina, Joseph (1965). Teach Yourself Maltese. English University Press. Borg, Alexander (1997). "Maltese Phonology". In Kaye, Alan S. (ed.). Phonologies of Asia and Africa. 1. Eisenbrauns. pp. 245–285. ISBN 9781575060194. Borg, Albert J.; Azzopardi-Alexander, Marie (1997). Maltese. Routledge. ISBN 978-0-415-02243-9. Brincat, Joseph M. (2005). "Maltese – an unusual formula" (27). MED Magazine. Archived from the original on 5 September 2005. Retrieved 22 February 2008. Vella, Alexandra (2004). "Language contact and Maltese intonation: Some parallels with other language varieties". In Kurt Braunmüller and Gisella Ferraresi (ed.). Aspects of Multilingualism in European Language History. Hamburg Studies on Muliculturalism. John Benjamins Publishing Company. p. 263. ISBN 978-90-272-1922-0. Żammit, Martin (2000). "Arabic and Maltese Cognate Roots". In Mifsud, Manwel (ed.). Proceedings of the Third International Conference of Aida. Malta: Association Internationale de Dialectologie Arabe. pp. 241–245. ISBN 978-99932-0-044-4. Wikivoyage has a phrasebook for Maltese. For a list of words relating to Maltese language, see the Maltese language category of words in Wiktionary, the free dictionary.